Teams are added to a competition, and are linked to the previously created clubs. Teams are then used to generate fixtures. 5. There are several options for adding Teams to your competition. a) If you wish to add several teams at once and require these teams to be directly linked to your previously created clubs (and thus the members associated to the clubs), then the suggested option is to select Add Clubs > move the relevant Clubs that are participating in this competition across to the right side box > Click Save. b) If you wish to create a team, select Add. From here, you can link it up to a relevant organisation within your database structure. c) If you wish to add multiple teams at once, select Add Multiple. Select the relevant number of teams you wish to create > Click Save. 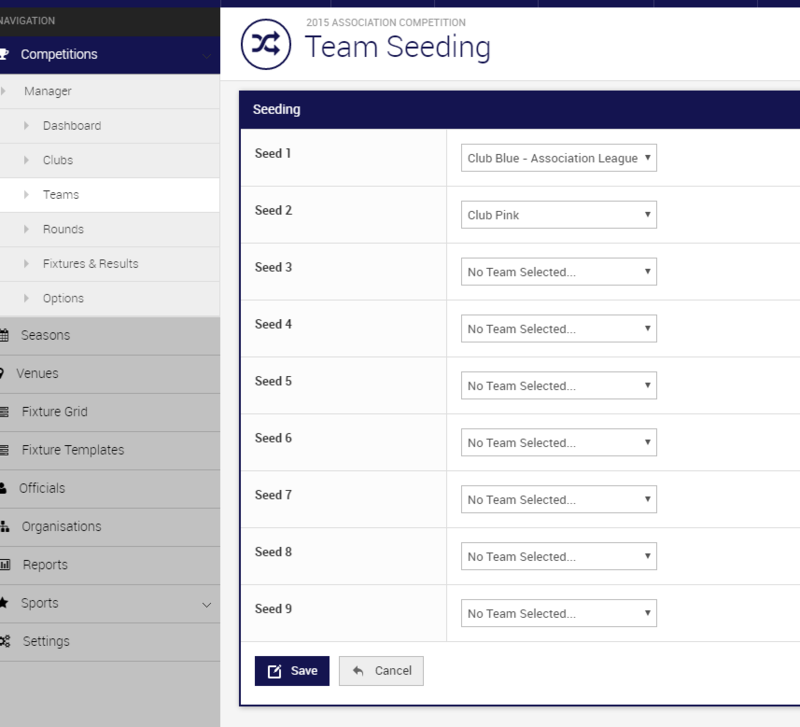 Seeding is used to assign each team a number, this number matches up to the fixture template used when generating fixtures. This allows you to control the fixtured games of the competition. 7. Allocate each team with a number, by using the drop down list to select the relevant team. 8. Once a team has been seeded, they will be removed from being selected as you progress through the seeding. Click Save once all teams have been assigned a seed number.